When the evil villain Rasputin attempts to finish off the Russian Royal Family, only Princess Anastasia and her grandmother, Empress Marie, survive. Marie escapes to Paris, but Anastasia is left behind in St. Petersburg. After ten years in an orphanage, Anastasia sets off to discover her identity, with no memory of her royal life. She finds two men seeking the reward money for turning in the Princess to the Empress in Paris. The three of them take the train to Paris together. However, Anastasia doesn't know that the men are only doing this for the money. The Empress has already seen many girls pretending to be Anastasia and is tired of being disappointed. 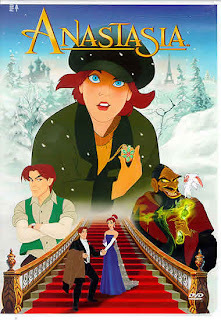 But the characters' persistence convinces her to at least look at Anastasia. After a joyful reunion and exciting events in the city of lights, everything ends happily ever after. The characters sing a song about Paris and dance on the Arc de Triomphe and at the Moulin Rouge. They go up in the Eiffel Tower. Because this is a Disney movie, it has the classic villain "scariness" that might not be appropriate for kids under six. Authored by my daughter, age 14. I've never seen the Disney version, but the true has always fascinated me. It was almost disappointing that they finally did DNA tests.